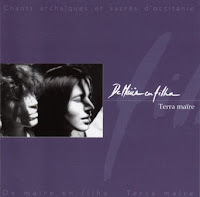 “Terra Maïre” is a unique duo of ‘a cappella’ singers. In the intertwined voices of “Terra-Maïre”(“Mother Earth” in the Oc language of the South), a world of essential emotions wells up, one that borders on the sacred and on sorcery. These are medieval and sacred melodies in Occitan, language of troubadours and Cathars, which touch the heart of an ever-growing public. 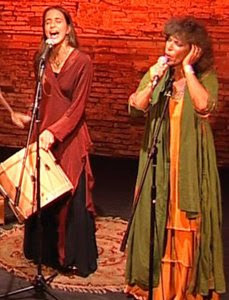 This musical adventure began in 1996, when Beatrice and Marie-Ange started out together on a pilgrimage back to their roots. As of then, mother and daughter - each with her own personality and her own artistic background - began to breathe life back into the secular songs of the land of their ancestors. These songs – prayers, laments, psalms – "chevrotés" or “sung in a quavering voice” by men and women who have gone before them and most of whom have disappeared, make up a unique heritage, a timeless tradition in danger of extinction. Those initial years of research constitute the thread of their first a capella recording, dedicated to the songs of the Rouergue region in Aveyron. 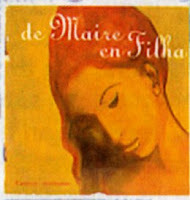 (“De Maïre en Filha” 1996. L’autre distribution). Here, with decided intensity and mastery, their two voices explore this traditional music. It is a music made not of notes, but of faces, of sharing, of sensations, where each song has its own colour, its own emotional and spiritual charge. Little by little, Marie-Ange and Beatrice became imbued with these songs, and they started to transmit the initiation or the symbolic role of the melodies, a sacred and archaic emotion. This led them to produce a second CD: "Terra Maïre : Chants archaïques et sacrés d'Occitanie” (L’Autre Distribution). It is a mature work, composed of mountain chants, “sorcery chants” or “circulars”, and prayer chants. In this new repertoire from the different areas of Occitanie, Beatrice and Marie-Ange’s voices bring out all the strength and mystery of the melodies. What started as a cultural and lyrical quest had now, for them, turned into an inner experience. Marie-Ange and Beatrice have decided to definitively take on the beautiful stage name of Terra Maïre, Mother Earth. Their performance has deepened and expanded; it now leads them to occupy a prime position in numerous festivals in France and abroad. One must go to one of their concerts, if even only once, to feel the depth of emotion they invoke in the audience and in professionals, who often come away profoundly moved. The deep, incantatory chants, the subtle dialogue between the voices, the sensitive participation of a talented cello player (Claire Menguy), mother and daughter’s twirling dances, Beatrice’ mystical dance… all contribute to giving the performance the intensity of an initiatory experience. Today, Terra Maïre participates with growing success in numerous concerts and festivals, both in France and abroad, while enriching its field of research with incursions into neighbouring vocal traditions (those of the Basque Country, Catalonia…). What's up to every one, the contents present at this web site are truly remarkable for people experience, well, keep up the good work fellows. and I'm stunned why this accident did not came about earlier! I bookmarked it. An impressive share! I've just forwarded this onto a friend who had been conducting a little homework on this. And he in fact ordered me dinner because I discovered it for him... lol. So allow me to reword this.... Thank YOU for the meal!! But yeah, thanks for spending the time to talk about this topic here on your website. in the dawn, for the reason that i like to gain knowledge of more and more. screen in Firefox. I'm not sure if this is a formatting issue or something to do with browser compatibility but I figured I'd post to let you know. I simply could not go away your website before suggesting that I extremely loved the standard information a person supply on your visitors? out of date rehashed information. Great read! I've bookmarked your site and I'm including your RSS feeds to my Google account. but I'm still new to the whole thing. Do you have any tips for beginner blog writers? I'd really appreciate it. Please let me know if you're looking for a writer for your site. You have some really great articles and I feel I would be a good asset. If you ever want to take some of the load off, I'd love to write some articles for your blog in exchange for a link back to mine. I ain't saying your information is not solid, but what if you added a post title that grabbed people's attention? Yahoo's front page and note how they create post titles to get people interested. You might try adding a video or a picture or two to get people interested about what you've got to say. and will come back later on. I want to encourage you to continue your great writing, have a nice weekend! well written article. I'll make sure to bookmark it and come back to read more of your useful information. Thanks for the post. I will definitely comeback. Generally I do not read article on blogs, but I would like to say that this write-up very pressured me to take a look at and do it! I am now not sure the place you're getting your info, but good topic. I needs to spend a while finding out much more or understanding more. Thanks for fantastic info I used to be searching for this info for my mission. It's lovely worth sufficient for me. In my opinion, if all web owners and bloggers made just right content as you probably did, the internet can be a lot more helpful than ever before. if advertising and marketing with Adwords. Anyway I'm adding this RSS to my email and could look out for much more of your respective intriguing content. Make sure you update this again very soon. I loved as much as you'll receive carried out right here. The sketch is attractive, your authored material stylish. nonetheless, you command get got an shakiness over that you wish be delivering the following. unwell unquestionably come more formerly again as exactly the same nearly a lot often inside case you shield this hike. Link exchange is nothing else but it is just placing the other person's weblog link on your page at suitable place and other person will also do same in support of you. your blog posts. In any case I'll be subscribing to your feed and I hope you write again very soon!